Numerous reasons have been given for the sudden reluctance of the USG to fly bombs to Damascus and turn it into a Tripoli or Bagdad. One that has not received much attention was the coming German federal elections. These are over, stability is assured, now the USG can continue on course, even if not at full speed ahead. Why were the German parliamentary elections important for Mr Obama? Certainly most people in the US have little if any idea where Berlin is, let alone who heads the government there. However the people who form the base of Mr Obama’s government, like that of his predecessor, know very well how important Ms Merkel has been for the pursuit of the two-pronged strategy of finance capital in Europe. To grasp just how critical Ms Merkel is one needs to rewind the film to 2002. Gerhard Schroeder of the SPD was chancellor and was challenged by Ms Merkel leading the CDU/ CSU, also called the Union because it is an electoral combination of the German federal CDU and the Bavarian CSU party. When the reigning US President Mr George W. Bush solicited the support of allies, Mr Schroeder– whether opportunistically or not– followed the opinion polls that showed the majority of Germans opposed to the Iraq War. He refused to contribute regular German troops to the invasion (sending only small covert units with a whisper). During the 2002 parliamentary election campaign Ms Merkel was seen on television visiting Mr G W Bush in Washington, criticising the position of Schroeder’s government and advocating German military support for the US invasion. It is generally accepted that this open violation of parliamentary protocol (both in Britain and in Germany it is considered unacceptable to publicly criticise the government of the day while abroad) together with her advocacy of a war for which no German support was to be found (except perhaps in the weapons industry) cost Ms Merkel the election. When Mr Schroeder finally retired to work for oil companies and banks, no surprise since his nickname in Germany was “der Genosse der Bosse” (comrade to the company bosses, as opposed to the workers), the SPD was left without anyone with either charisma or a programme. So the opportunistic SPD – Green coalition was ended in favour of a Grand Coalition which was ultimately led by the CDU after Schroeder’s return to working directly for the “bosses”. Ms Merkel was a creation of the last years of the Helmut Kohl regime. She was adopted by him as a kind of poor sister from the newly absorbed GDR and replaced the insufficiently subservient vice chancellor Lothar de Maziere, a leftover from the short-lived post-Honnecker GDR government who was part of the government that signed the GDR over to the BRD in return for an absurd currency reform and lots of promises. Ms Merkel learned quickly from Kohl two things quickly: how to eliminate intra-party competitors and how to manipulate the media. She is treated as business-like, motherly (although she has no children), a post-GDR success story (although she was entirely GDR conformist until 1989), steady and uncontroversial (although she has presided over intensified military involvement overseas in violation of German law and privileging of German banks and industry in the ruin of Greece). In short Angela Merkel is coated with a far more advanced version of political teflon than was available in Ronald Reagan’s day. There is an explanation for this phenomenon too. Since 1989 the German media has been substantially transformed. Under US occupation the Federal Republic (West Germany) was officially well aligned with USG/ NATO policy and the media reflected that. However, the conditions of the competing Germany east of the Elbe still had to be countered. One of these was the official and psychologically very deep aversion to wars and military action. It is a matter of record that Konrad Adenauer introduced the rearmament of Germany in the 1950s at the behest of the USG only by parliamentary tricks– although there was massive opposition to it from Right to Left. The 1980s fight over stationing of Pershing II missiles in Germany was not only opposed by the Left. In 1991 the SPD even tried to appeal against Mr Genscher’s triggering of the war against Yugoslavia by appealing to the Federal Constitutional Court, arguing that the actions violated the German Basic Law forbidding anything but defensive military operations. By 1989 however the alternative Germany was gone and an enormous market emerged to show just how happy we should all be about the GDR’s demise. A key media instrument emerged: the weekly Focus, published by the Burda Group, with a format that was a carbon copy of US News and World Report. Burda, along with the Springer publishing house in Hamburg, could be considered real “cold warrior publishers”. They worked very closely with the interests of the USG and there is certainly every reason that they received the support which USG agencies are known to have provided and still provide to sympathetic media. In any case Focus became despite enormous losses (if the accounts are to be believed) an overnight sensation, setting the agenda even for the established “serious” media like Der Spiegel and Die Zeit. It did not take long before the mainline “serious” press had completely shifted from political issues to the self-fulfilment/ consumer interest focus Americans associate with People or Oprah. Only the FAZ, the staid German equivalent of the New York Times, resisted this trend– even rejecting the controversial new German orthography adopted in the 2005. This new Americanised media landscape pronounced for good three months prior to the actual elections– there were no issues and it would be a boring election campaign– although Ms Merkel’s government had authorised a very controversial deployment of troops to Afghanistan and measures that definitely worsened the condition of wage-earners and unemployed. Unlike in the USA, Germans still tend to vote. Hence it was very clear that the media was erasing the issues which were really controversial– esp. sending German troops abroad– to avoid the loss Merkel suffered when she supported Bush against Schroeder. One could go into details about the importance of Germany for US Europe/ NATO policy but it should suffice that any uncertainty about how public opinion or public policy in Germany is managed would complicate the US plans for Syria. Germany is also the main force on the Continent for enforcing financial policies desired by the Anglo-American banking cartels, e.g. keeping the EU political management (as opposed to the technical management in Brussels) from interfering with US plans in Euroland. Ms Merkel is not so important for what she does but for what actions she is able to conceal from public debate or examination. The certainty of a renewed Merkel chancellorship includes reasonable certainty that Anglo-American banks, together with their German allies, will be able to determine fiscal policy on the Continent– with the euro. There will be no threats to the present parasitic processes. Ms Merkel will also continue to conceal the extent of German industrial and military involvement in US imperial wars. Any doubt Ms Merkel aims to conceal can be seen in two major changes in the government during her last term. The Federal President, and former IMF director, Mr Horst Köhler, resigned after he told German journalists in an interview returning from Afghanistan that Germany would have to be willing to use military means to protect its economic interests. 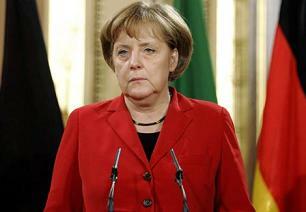 Later Ms Merkel’s defense minister was forced to resign, ostensibly because of plagiarism in obtaining his doctorate. Mr zu Guttenberg however had become almost a German Bob Hope with his frequent rallying visits to German troops stationed in Afghanistan– about whom the less said the better. Now enter Mr Obama with his party (in the widest sense of the word) requiring escalation against Syria. Germany and Russia have a strained but nonetheless strong and dependent relationship to each other. Germany is also closely tied in its relations to Turkey. Although Germany is regularly bludgeoned with the “Holocaust” club to maintain its subordination to Israeli policy, there is no great love for wars on Tel Aviv’s behalf: there are enough people who also are tired of being called Nazis after more than 60 years. In short, launching cruise missiles before 22 September could well have forced Ms Merkel into an open statement supporting or opportunistically opposing the US attacks. A debate about Ms Merkel’s military policy led to her defeat in 2002. If the US had attacked before the election, Ms Merkel would not be able to avoid a public statement and the debate that followed. Today the election returns are not official but it seems clear– barring some kind of mysteries– that the CDU/ CSU– the Union that Ms Merkel leads as chancellor will have by far the most seats but short of an absolute majority. Whatever government is formed in the next few weeks will not have to debate US military action. However the fact that the Left (Linke) Party won slightly more than the Green Party is probably an indication that had there been a clear issue like “war or no war against Syria”, the Union would have lost with the SPD many more votes. Despite US propaganda for “humanitarian” pretexts, most Germans are still aware of the burden of two world wars for which they have been blamed and which destroyed much of their country. Americans have never known this kind of defeat or destruction (except perhaps Daughters of the Confederacy). It is still possible to find people who oppose deploying German troops abroad– if only to avoid blame or repercussions. The risks to Ms Merkel’s reelection were there– even though the Press did its best not to talk about them. There is another aspect of this whole seemingly monotonous drama: since Germany is not only a major silent partner in US wars but also a partner in the currency manipulations within the Eurozone, consistent policy in Berlin is important for maintaining the “Goldman Sachs line” in Southern Europe and Brussels. Berlin brings the necessary political power to bear. Since Middle East policy is not only about oil but about the stability of the US dollar as the “oil currency” with which the US is able to subsidise its otherwise moribund economy, Germany’s predictability in Brussels and Athens is just as important for currency speculators and dollar supremacy as the military force it contributes to US war efforts. The re-election of the Union assures for now that German politics will pose no threats to the transatlantic agenda.